Super Hero Boy: Sppppoooooky Sheep! Heh, Shaun the Sheep Little Sheep of Horrors had me laughing before we even opened the dvd. There is just something hilarious about that little gang of fuzzy sheep and this cover takes the cake on all the previous children's dvds we've reviewed. 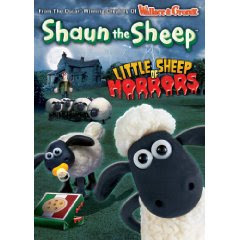 Included on this dvd is six hillarious Shaun the Sheep epsidoes including : Little Sheep of Horrors, Abracadabra, The Things That Go Bump, Heavy Metal Shaun, & Troublesome Tractor Sleepwalking. My favorite was the one that the dvd is titled after, Little Sheep of Horrors, little Timmy really wants to watch the horror movie the farmer is watching and decides to sneak in to watch himself without telling his mom. Needless to say the sheep think something awful has happened to little Timmy and sneak into the farmers house in an attempt to rescue him only making a huge mess of things. If you have never seen Shaun the Sheep you can't help to fall in love with Timmy, the baby sheep, with his cute little pacifier. If your looking for something fun, but not at all scary, to watch for the Halloween season with the kids. Shaun the Sheep Little Sheep of Horrors is a title everyone in the family will enjoy. Shaun the Sheep Little Sheep of Horrors is available right now and you can pick up your own copy on Amazon!